One of the main areas of interest of the members of Kvinterna is music of thirteenth and fourtheenth-century Christian and Jewish Europe. Apart from medieval Spanish songs such as "Cuando el rey Nimrod" or "La rosa enflorece", its repertoire also includes Bohemian music and music of the royal court, particularly that which was contemporary during the reign of Emperor Charles IV. 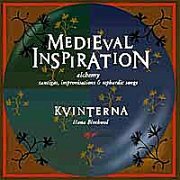 Kvinterna performs music inspired by medieval alchemy. An important part of all its performances is improvisation by its members, who also compose and then perform their own compositions. They use copies of period instruments and various 'ethnic' instruments, and often non-European, oriental influences, ornamentation, and rhythmic models appear in their music. Their aim in interpretation is to revive the inspirational multicultural environment of a former age. The ensemble renewed its activity in 1994 and since that time regularly performs at home and abroad. It takes part in various festivals of ancient and also alternative music. Kvinterna's concerts often have a theatrical quality, where the music is reinforced by movement and light. It collaborates with radio and television, and recently took part in the making of an American documentary film about alchemy in Bohemia. Previous recordings by Kvinterna include Dvorska hudba doby Karla IV (Music of the Court from the Time of Charles IV), used in the film Magister Theodoricus, which was part of the 1998 National Gallery exhibition of the same name in Prague, and Ritualy stredoveku (Rituals of the Middle Ages). guests: Dan Dlouhy - percussion (1 - 7, 9, 10, 16); Petr Filak - "ud" arabian lute (11 - 13); Lubomir Holzer - percussion (6, 8, 11 - 14), vocal (13); Michal Sodja - didjeridu (6, 8), shakuhachi, jew's harp (11,12); Libor Stetkar - vocal (13); Milos Valenta - alto fiddle (11, 13, 14). Alchemy is the hermetic art, teaching about the spiritual life of matter, its development, and transformation. It is philosophy and mysticism. From the beginning it was called Music. It demonstrates that matter, from its inception, through the Spirit, by necessity heads towards perfection. The first creative principle of the existence of matter in creation, according to the medieval alchemists, is the 'Black Madonna'. The first substance, prima materia, of the symbolic colour black, is the primitive matter created by God, and is called Chaos. All matter arose from this through the interaction of the four elements and three principles. The first differentiation of primitive matter led to two contrary alchemistical principles - symbolic Mercury and Sulphur. In alchemy, transformation into the first spiritual state is called the stage of Mercury and takes places symbolically as dissolution. It is understood as the feminine principle and its colour is white. The concluding part, namely, mystic death, is a necessary condition of the initiation of the Spirit on the path to the preparation of the Great Work. The alchemistical stage of Sulphur represents the masculine principle and the synthesis of matter. Its colour, red, represents the element of fire, symbolizing power, the apostleship, the supremacy of Spirit over matter. Medieval Christian alchemy links it with the blood of the crucified Christ and with the apocalyptic stage of Christianity. The final apocalyptic transformation was the gate that had to be passed through to enter the final stage of the Great Work, namely, the preparation of the Philosophers' Stone. Both principles - Mercury and Sulphur - are connected or divided by a third principle - the harmonizing energy of the salt of the Stone. They are the effect of contrary forces in Nature, and in the Middle Ages were depicted as warring female and male figures with the attributes of both principles. This recording came about only as the result of broader circumstances. The music is therefore not an artificial creation, but a statement in time. The elaboration of my philosophical and musical conception is the result of collaboration between all members of the group Kvinterna and its guests. We developed the proposed musical themes on the basis of our own improvisation, our experience of interpretation as a group, and astrological predestination. The composers of the supporting melodies of the parts of Materia prima for the individual elements are Petr Vyoral (Earth, fidula, the earth sign Taurus), Pavel Polasek (Water, santur, the water sign Pisces), Premysl Vacek (Air, lute, the air sign Gemini). The 'ethnic' instruments of Michal Sodja (didgeridoo, the fire sign Aries) create the archetypal basis of the 'Fire' and 'Sulphur' parts. A role equally expressive and in some parts dominant is played here by the rhythmic element, which not only has the function of creating rhythms and imitating sounds, but often also evokes the atmosphere of the broader space of the work. The creative completion of other parts of Materia prima - 'Chaos' and 'Fire' - is an example of the compositional contribution of Dan Dlouhy (drums, the water sign Pisces) in colloboration with Milan Bilek (drums, the water sign Cancer). 'Mercury', representing the feminine principle, dissolution, is my variation on the late fourteenth-century song in praise of the Blessed Virgin Mary, 'O Virgo splendens', from the convent in Montserrat, Catalonia, and is interpreted with a multi-dimensional musical layering. The canon for two voices, supported by the special sound of regular beating on a metal kettle, creates the melodic and rhythmic base, taking place in real time, over which, with the effective sound-imitation of gongs and other metal percussion instruments, the dialogue of the bombard (a bass shawm) and woman's voice soars. 'Sulphur' (synthesis, the masculine principle ) is a commemorative fragment on the work of the percussionist Lubom'r Holzer, and has here a system-creating function. 'Stone' uses the acoustic spreading of aliquot tones of singing, of Tibetan bowls, and of the banging of gongs, in the chapter house of a monastery against the musical background of a parlando of a magical Latin text; in terms of content it relates to the emergence of the Philosophers' Stone and spiritual gold. The introductory Sephardic song 'Criador', comes from thirteenth-century Spain, and is dedicated to the Creator and the celebration of His work, as is the case with the closing psalm, 'E lohenu Welohe'. This alchemistic musical cycle, inspired by Christian and Jewish philosophy and also by the music of medieval Spain with demonstrable influences of the Orient, is joined by Spanish music of the period - the 'cantigas', which come mainly from the thirteenth century. 'On das do mar', 'A que por', and 'Como poden' are from the anthology Cantigas de amigo; the song 'A virgen Santa Mar'a' comes from the Marian songs known as Cantigas de Santa Mar'a. The songs of the Sephardic Jews, 'La rosa enflorece' and 'Quando el rey Nimrod' originated in old Spain. The interpretation of original work, just like passages of new musical improvisation, is influenced by the encounter of various cultures, which for us is a re-discovered source of inspiration.